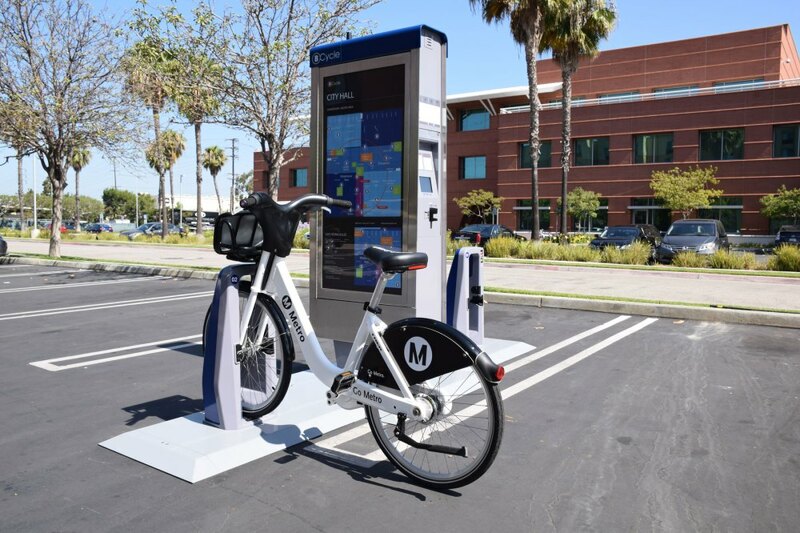 Friday, the City Council formally agreed with Metro to bring over 1,000 bike-share bikes to Downtown Los Angeles as soon as “sometime in 2016.” The cost of the system will be split between Metro (35%) and the City (65%). Proceeds from naming rights will go to Metro, and advertising from the bikes and kiosks to Los Angeles. If successful, bike-share will spread to North Hollywood, Hollywood, Venice, and elsewhere. Of course, there are some issues. Santa Monica, Long Beach, West Hollywood, and Beverly Hills have all chosen a different bike-share provider, with a different technology and different fee-collection system. Santa Monica’s Breeze system is currently testing a limited pilot, with the full program going online in November. This means that people visiting attractions in Hollywood or the beach areas could be faced with trying to decipher two different systems. Hopefully, Metro will be able to adapt its TAP card to work for both bike-share systems to reduce the confusion. But the good news is: it’s official. From Wendy Greuel’s vision in 2008 to the debacle with Bike Nation, Los Angeles took the long road to bike-share. But we’ve emerged with a contract, plan, and timeline to bring bike-share to Los Angeles. Do you have any thoughts on the plan or suggestions for Metro/L.A. City? Leave them below. I’ve really enjoyed the smart bike so far in Santa Monica. There’s a grocery store on the main bike artery (Broadway) and I like the flexibility of briefly locking the bike up to make a quick stop for groceries. I agree, though crazy is a pretty strong word. I would propose that Santa Monica increase the daily use maximum limit for the basic membership ($119 per year) from 30 minutes to 60 minutes, and the limit for the upgraded membership ($149 per year) from 60 minutes to 120 minutes (or better yet unlimited, like most bike share systems). They should also reduce the overage charge for long-term memberships from $6 per hour to $3 per hour. (When you consider that the overages are rounded up to the next minute, 5 cents a minute doesn’t sound too bad.) I can justify their base rate ($6 per hour) for one-time users, since this limits their competition with commercial bike rental shops. I don’t have high hopes for this system. I think it is going to do pretty badly and probably spoil any future plans for bike share. I figure, keep expectations low and you won’t be disappointed. Wait, they’re going to charge six bucks an hour for this? That’s insane. It’s not like you can go far in an hour on a bicycle either. If I’m going to pay six bucks just to go somewhere that’s not far off, I’d rather just call Uber which is like only four bucks for the shortest trip. The comment below is in reference to Santa Monica’s system, which has a few bikes up and running now. The Metro system, launching first in DTLA will (hopefully, most likely) have fares integrated with Metro. So for $1.75, you get two hours of transfers from bike to bus to train, etc. (with the limit of 30 minutes of biking at a time). Bikeshare would also be included in Metro day passes, week passes, and month passes. Basically, fare for 30-minute bike ride would be just like boarding a train or a bus. That’s IF they can successfully work out the technical details to make it work. Why not? I actually have very high hopes for it, looking at the density of planned station locations and goals for fare structure. I think LA is thinking of bikeshare as part of the transit system, which is a better mindset than most cities with bikeshare. That being said… I worry about the lack of real safe streets for biking. I see drivers being pissed off all the time when there’s suddenly a daily “critical mass” bike ride all over Downtown. Pissed off drivers do things even more unsafe than usual, and I fear that people may get hurt. What it SHOULD do is speed up the bike-friendly transformation of our streets Downtown, what it will probably do instead is inspire tons of people to write angry letters to the LA times saying they “support biking” but we need to get all the bikes our of our city. I’m also skeptical of charging non-SM residents 50% (!) more, but I suppose it’s hard to judge until the financial numbers come in – will those be public? And also… is there a single city-owned parking space that rents for $6 an hour? Bikeshares are great, it’s just worth remembering that despite all its progressiveness, SM treats bikeshares like a wayward stepchild that must have its allowance cut (i.e. user fares must cover operational costs, which may be wise, but ignores positive benefits from bikeshares and the costs of the alternatives), while parking is subsidized and fiercely protected. The operation and maintenance of the bikesharing system is not free, nor will rental fees be enough to cover all of these expenses. There is a contract with outdoor advertising companies for bus shelters and bus benches that prohibit advertising at the kiosks. There is the possibility of a small amount of advertising revenue coming from placing ads on the bikes. One of the sources of funds that Los Angeles will use to eliminate this operation and maintenance deficit is money that is dedicated to installing bike lanes. That is currently about $2.1 million annually. The financial need of the bicycle sharing system could drain this dedicated source of revenue of hundreds of millions of dollars annually. Which would greatly reduce the ability to install on-street bicycling treatments. I am quite jaded. Metro had been funding anti-bike politicians through their ad buys. Metro’s got a crummy record with “technology” rollouts. I’m also wary of the DTLA-only nature of this program. Metro’s “Bike Instead”/”Walk Instead” advertising campaigns had been pouring thousands of dollars into Lamar Advertising, Outfront, and Clear Channel’s bank accounts. All of these billboard companies have strong ties to Gil Cedillo and Paul Koretz. Which means that Metro is funding the campaigns of two of the most anti-bike and anti-walk council members in the City of LA. Ditto for the California Department of Public Health with their “CA Champions for Change” campaign and Metro’s “Everyone Wants a Faster Commute” campaign. That is hundreds of thousands of dollars spent in multi-year large ad buys across the city. Lamar, in particular, “donated” huge billboards to Cedillo in the last election. Metro has been funding opposition council members – people who will stymie bike share efforts, and bike network expansion. And speaking about bike share, the rollout of TAP has been miserable. It is a broken system, from the ground up, in the way it treats groups of riders. I cannot use my TAP card to let me and my wife ride without buying her a separate card. The squad of parasites at Metro in charge of TAP are now rolling out a bike share that is totally contained in DTLA. I have my doubts about their ability to get this done well. Finally, it sends a very poor message to the rest of the County that Metro is doing this marquee project in Los Angeles and not any other areas of the county. I think it’s generally accepted (maybe not) that TAP’s rollout was horribly mismanaged and was a huge blunder at first, but when new staff was put in charge a few years ago they have made great strides in fixing it up. I don’t know any Metro system that will let you pay for multiple people on the same card… particularly with fare policies/transfers, that’s just not a simply feasible way to do it. If there are some, I’d love to hear about the experience on those and how it works and how their fare structure allows for it. Another problem I see with allowing one card for multiple riders is that people will be charged multiple times if they accidentally or for any reason tap multiple times. Right now, that doesn’t happen within 2 hours (you’re either rejected for having already tapped, or it’s counted as a transfer, depending on where/when you tap). About bikeshare being contained in DTLA… I’d argue that’s where it makes the most sense to start. The core city (of any city) is the area where these short trips are going to take place most often, and make sense as the start of any program. Of course, I’d love to eventually see bikeshare with stations spread densely throughout the entire county in one massive system, but it’s not a realistic starting point. The plan for Metro’s bikeshare already includes expansion in Pasadena, Hollywood, and Venice… then other LA County cities can get on board as well, and after that we could see the less dense areas between those cores filled in as well. This is years out, no doubt, but we aren’t going to suddenly saturate the county with bikeshare from day 1. Like I said before, the biggest thing that makes me optimistic about the system is the fare structure and the way it’s considered the same as a trip on a bus or train. In other cities, bikeshare is completely separate, with a separate cost, etc. In Los Angeles, IF it’s implemented correctly (and that’s always the big if), it will better provide people with a wider range of options for every trip, as well as influence the way people think of their options for those trips – they won’t feed tied to any particular mode because that’s the pass they have. In NYC you can swipe multiple people in on a single card (as long as it’s a pay-per-ride and not an unlimited card), and if you’re transferring it will give you the appropriate number of transfers for how many times you swiped the card. That’s a good point, I totally forgot about that in NYC. Are there “transfers” there? I haven’t ridden a bus in NYC so I don’t remember, but wasn’t the subway typically a gate to get in and then you’re free to move between lines within the gate as much as you want? Once you’re in the subway, you’re in the subway. There’s at least one “virtual tunnel” where if you swipe back in it’s like you didn’t leave the system (I think—I’ve never done it but I think it’s that way instead of eating the transfer you’d be able to use to get to the bus), but generally speaking, yes, it’s a single flat fare and the entire system is within the fare-control zone and transferring between lines just means getting off your train and walking over to a different platform. For trainbus transfer you get two hours to either swipe into a train station after putting your card in the reader on a bus, or to put your card in the reader on a bus after you swiped into the subway. I know there’s a few special more-expensive buses where you transfer isn’t free, I *think* you just pay the difference between the standard fare and the fare for those buses in that case (this is one I haven’t done nor have I ever investigated the workings of). Bike share can and has lead to more bicycle infrastructure being built to accommodate more riders. It’s not even just Critical Mass type events. Even me by myself on my bicycle, minding my own business just trying to legally transfer from one side street to another (most bike routes in Central LA are not continuous or contiguous) get honked at if they even have the inkling suspicion they might have to wait behind me for 2 seconds before they can safely pass me. Not even that. I highly question the choice of using smart bikes in the first place with an unproven vendor. Labor costs of re-balancing the bikes is the most expensive part of the ongoing maintenance of a bikeshare system. Having to look for and pick up bikes in more than one place will place a higher cost on that aspect alone, even with the incentive program Santa Monica’s system is trying to tout. Looking for that one wayward bike will probably eat more time than loading and unloading several bikes docked at a smart dock.